An incredibly bright young woman, it was perhaps the happiest accident in Mary Russell’s life when she nearly trod directly upon a lounging and retired Sherlock Holmes in the hills near her home. Impressed by her quick wit and powers of observation, Sherlock welcomes the young orphan into his home and his life and, as she grows, takes her to be his partner and intellectual equal in a way that Watson never was. The first in the Mary Russell series, “The Beekeeper’s Apprentice” covers approximately the first four years in the Sherlock Holmes-Mary Russell partnership. Laurie R. King gave me warm fuzzies beginning with the prologue of “The Beekeeper’s Apprentice,” wherein she wrote a note to the reader asserting that she had received a chest in the mail containing a pile of manuscripts from, ostensibly, a woman named Mary Russell, who she could not track down. King goes on to say that she was so taken by the story within that she did little more than clean up the spelling and grammar and slap the work with a more appealing title, and then publish it for the anonymous Ms. Russell. This fits perfectly into the grand tradition of Sherlockians, many of whom dogmatically assert that Holmes was a real man, and Conan Doyle only Watson’s literary agent (whether they actually believe this I am unsure, but it is an amusing, if baffling device). Thus, this forward by King sets her series up to be a real continuation of Conan Doyle’s beloved work. King is also quite smart about how she sets up Mary and Holmes’ world. 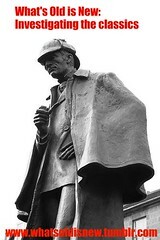 From the beginning, the characters make note of some of the literary license which Watson took with Holmes’ adventures, thus assuring that any deviation on King’s part from Conan Doyle’s canon is explained away ahead of time. “The Beekeeper’s Apprentice” is a highly engaging Sherlockian pastiche. Mary Russell humanized the famous detective, who was already somewhat mellowed by his partial retirement, making for a much more likable Holmes than in many of Conan Doyle’s later stories. The beginning of a lengthy series such as this requires a great deal of characterization and set up, but King did a great job providing this while still keeping the story moving. I really enjoyed “The Beekeeper’s Apprentice” and am looking forward to continuing the series. Recommended.